WASHINGTON — Last year, more than a quarter-million people worldwide died from pancreatic cancer. After losing a close family friend to the disease, Jack Andraka, 16, learned firsthand just how deadly it can be. That prompted the Maryland teen to create a simple test to detect pancreatic cancer at its earliest stage of development, a breakthrough that could save many lives. The gifted young scientist, who was an invited guest of First Lady Michelle Obama at the president's State of the Union address Tuesday, is now working to bring his invention to market. Last year, Jack's pancreatic cancer test won him the grand prize at the Intel International Science and Engineering Fair, the largest high school science competition in the world. He is the youngest-ever recipient of the $75,000 award, beating out more than 1,500 students from 70 countries. Jack's win follows a lifelong interest in science. It's a passion encouraged by his parents, inspired by his brother -a prize winner at the 2010 Intel Fair- and nurtured at his high school in Glen Burnie, near Washington. Jack began working on the simple and inexpensive test soon after his close family friend died of the disease. “I went on the Internet and I found that 85 percent of all pancreatic cancers are diagnosed late, when someone has less than a two percent chance of survival, and I was thinking, ‘That’s not right. We should be able to do something,’” Andraka said. He also learned people with pancreatic cancer have elevated levels of a protein called mesothelin in their bloodstream, and that early detection is key to increasing the chances of surviving pancreatic cancer. 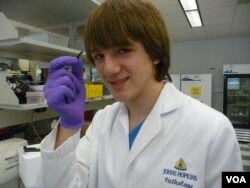 After gaining permission to work in a lab at Johns Hopkins University in Baltimore, Andraka developed a simple paper sensor -incorporating a novel mesh of tiny carbon nanotubes and antibodies- which can detect the mesothelin in a single drop of blood, signaling the presence of pancreatic cancer at its earliest stages. His test has proven accurate 90 percent of the time and is 100 times more sensitive than current tests. "One of the most important things about this is that it's found in the earliest stage of the disease when you have close to 100 percent chance of survival," Jack says. "It costs three cents per test, only five minutes to run. [The] urine or blood sample requires one-sixth of a drop." Jack's achievement would not have been possible without Dr. Anirban Maitra, professor of Pathology and Oncology at Johns Hopkins University, and the only person out of 200 researchers to respond favorably to Jack's emails describing his project. Maitra gave Andraka a corner of his lab, where he worked for seven months completing his project. “I think a lot of credit also goes to his parents, who throughout his childhood immersed him and his brother in scientific magazines and encouraged them to read,” Maitra says. Jack has patented his pancreatic cancer sensor, and is talking with companies about developing it into a simple, over-the-counter test, which could eventually provide life-saving early detection of other types of cancer as well. Whatever happens, his mentor believes Jack Andraka's name is one we'll be hearing again over the next 10 to 20 years.